Sundance has been manufacturing quality trampolines and rebounders for over 40 years. We make great products - built to last. The life of our products can be measured in generations. Our most popular rebounder. We use 36 standard 8.5" trampoline springs, giving you the ultimate in rebound performance. This rebounder is the most fun to use. It has the best, deepest and softest bounce. You will love the feel and bounce of this rebounder. It feels as if you're bouncing on a large trampoline. 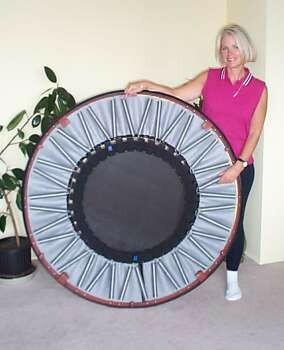 This rebounder gives the maximum G-FORCE to the user, which in turn means greater exercise value. (higher bounce = greater G-force = greater exercise value). You can add a single assist bar to this rebounder for $199, however, they are sometimes out of stock and may need to be manufactured when ordered.